When IBEW 1245 President Emeritus Mike Davis passed away in mid-January, the loss sent shockwaves through the union. To commemorate Davis’ life and his contributions to the union, the IBEW Local 1245 Executive Board held a small memorial for his friends and family in conjunction with the quarterly Advisory Council meeting. Former Business Manager Jack McNally worked closely with Davis over the course of many years. During the memorial, McNally shared many anecdotes about Davis, including a story about his no-holds-barred approach to enforcing the union’s expense policies when he served as Local 1245’s treasurer – questioning and even rejecting one of McNally’s own meal expenses to set an example. 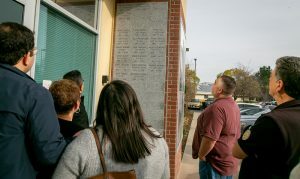 The family took a moment to look at Davis’ name etched on the memorial wall near the front entrance of the union hall. Steve Rayburn, PG&E’s former director of labor relations, often sat on the opposite side of the table from Davis during labor-management meetings, but despite this seemingly adversarial relationship, he and Davis formed a unique bond. Rayburn wasn’t able to attend the memorial, but he sent in a letter, which Dalzell read aloud to all in attendance. Dalzell shared a story from early in his career as business manager, when he and Davis were debating whether or not they should push for a dues increase in order to build up a war chest to use for big fights that they knew would soon be on the horizon. Current President Art Freitas viewed Davis as an invaluable mentor, and expressed his appreciation for the lessons he gleaned from his predecessor. Davis’ widow, Dee, and several members of the family were in attendance at the memorial as well. 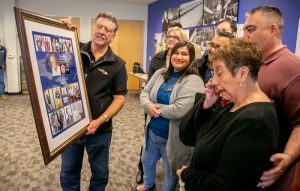 The union presented the family with a framed photo collage, featuring photos of Davis throughout the course of his 45 years with the union. Davis’ family was a bit too emotional to speak at length during the memorial, but his wife managed to hold back tears for a few moments to share some sentiments. “Thank you for everything you’ve done for him — and for us,” she said.